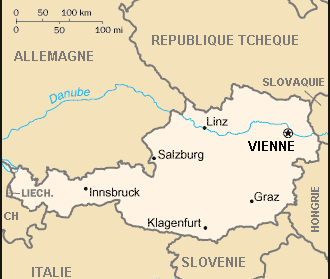 Austria : When and where to go? The climate is continental in type across a large part of the territory with however moderate changes in temperature, except at altitude, where a more Alpine climate entrains a greater range of temperature with, of course, heavy snowfall at times. The ideal time for visiting Austria depends on your reasons for visiting the country: Visiting Vienna and Salzburg is very pleasant in autumn or the spring, although the enjoyment of winter sports can continue from December to April. The mountains and forests are also very pleasant in summer between the showers and summer thunderstorms. Various international airports are served by airlines from numerous countries throughout Europe. It is also easy to get to Austria by train or car, the road and rail systems are very efficient. An identity card is sufficient for European citizens. The budget required for a stay in a reasonable establishment is similar to that of France; a meal will cost less than €30 and a double room around €100. These prices are higher in Vienna and Salzburg. Do not forget to include entry fees for museums and historical buildings in your budget as these can prove to be fairly expensive. There are no particular health problems that are present here.